Welcome back mes amies. 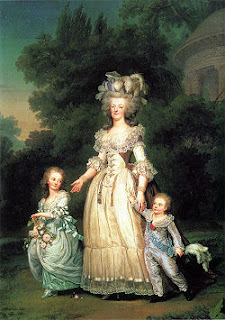 This is Part II of my blog on Marie Antoinette. (Click here for Part I) Earlier this week, I left off with the story of the Diamond Necklace Affair and today continue with the rest of the short life of the ill fated French queen. I also want to say here, and I’d love your opinion, that I feel bad for the queen. Sure she may have had some issues, but it seems that the people were out to get her from the beginning. In the end I think she and the rest of the monarchy paid a hefty price for freedom. But I suppose with all quests for freedom and overthrowing a leader there will be blood. I would also be remiss in my accounts of Marie Antoinette’s life if I didn’t mention her good friend, Count Axel von Fersen. In fact it had been rumored because they are so close that the two were lovers, and the people even accused Marie that her second son was Ferson’s and not Louis’s. However there is absolutely not evidence that the two were anything beyond good friends, and for a queen who was severely lacking in support, any loyal friend was cherished. During that eleven months prior to the death of their child, the financial situation in France was rapidly deteriorating, as was the political power of the king and queen. The Assembly of Notables, who’d not been called to order for over 160 years, was assembled to attempt to pass some reforms to assist with the financial ruin of the country, since parliament was of no help to King Louis. Marie, being of ill health was not present, as well as being absent at subsequent meetings. The assembly rather than realizing she was of ill health from giving birth and suffering shortness of breath after, thought she was not attending on purpose to undermine the whole affair. The assembly failed with or without the queen as they did not pass any of the reforms. The situation in France continued to decline, and Marie decided to become more involved in the political affairs and her children, and less involved in her previous carefree interests. 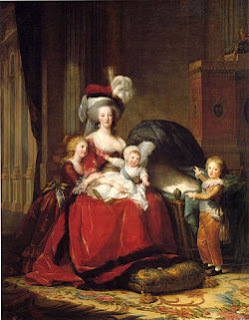 She was attempting to salvage her reputation from the Diamond Necklace disgrace and realizing her children were the future of France and the country was in shambles, she wanted to improve it. At the same time the king himself started to suffer from some bouts of depression, so perhaps she was trying to also pick up her husbands role, as most couples do, you balance each other out. She tried with a portrait of herself and her children to have the people view her differently, but it was overshadowed by two things. One the youngest princess had died and her portrait was painted out of the cradle, and two, Countess Lamotte had escaped to London and began publishing her rubbish. In November of 1787, the king who was feeling better, and subsequently the queen had taken a step back, exiled Parliament in an attempt to force through legislation that would help the country, but he was challenged by the new Duc D’Orleans, his cousin, who he also exiled. The people notably did not agree with all of these actions and further threw fits when in the summer of 1788, King Louis brought back another political entity that hadn’t been around for over 150 years, the Estates General. Marie Antoinette, during all of this had abandoned a lot of her political fervor to take care of the ailing Dauphin. At the time he was suffering from tuberculosis and was so ill in fact his spinal column and twisted severely. During the late summer of 1788 she did step in to assist in recalling Jacques Necker as the Finance Minister, which at the time was a popular move, but always being the scapegoat, Marie was blamed with bread prices soon began to rise. Riots broke out across the city in the spring of 1789, and to make matters worse, in June 1789, the Dauphin Louis-Joseph, died of consumption at the age of seven. His title was passed to his younger brother Louis-Charles. The following month the people stormed the Bastille. At the time the prison only contained seven prisoners, but it was a huge breakthrough for the people, and symbolized the breaking down of a government they did not agree with. Bastille Day is celebrated today as a National Holiday. (I actually attended a Bastille Day event at the French Embassy in D.C., I thoroughly enjoyed myself.) Needless to say this was a majory turning point, and one of the first in the French Revolution. By September, the shortage of bread was leaving many people starving and in October, when a dinner was conducted for the royal bodyguards the people went wild with hate, believing the king and queen were hoarding bread. On the 5th of October a mob of women stormed the castle, now known as the March of Women on Versailles, demanding the queen’s blood. They killed several bodyguards, but were not able to get to the queen – yet. However, they did force the royal family to Paris, where they sort of placed them under house arrest in Tuileries Palace. Marie at this time decided she would no longer involve herself in the politics as it had only proved to anger the people more in the past. She did still perform her continued charitable work, but at the same time she secretly appealed to other European nations for help, including her brother the Emperor of Austria. Many escapes plans were made and none met. Most of them Marie did not agree with, because they were in favor of her only leaving with her son and she wanted to leave with her whole family. With the help of her long time friend Count Axel von Fersen, the family was able to escape Paris under disguise as peasants on June 20, 1791. They headed for the French-Austrian border where her brother awaited with troops to rescue the royal family. However half-way there, they were caught when recognized by villagers in Varennes. They were taken back to Paris and were now prisoners of the revolutionary government. Because they had tried to escape, the new political party exploited them and what little shreds were left of their popularity were completed depleted. A little over a year after they were almost free of the horror their lives had become, things got worse. On August 10, 1792 the royal family was attacked in their home by militants demanding that the Legislative Assembly suspend the king from his duties, declaring literally that Louis was no longer king to the French. Hundreds of Swiss guards, who protected the royal family, died in the fighting. The family was taken from the palace and imprisoned in the Tower of the Temple in Marais, originally a headquarters for the Knights Templar, it was later used as a prison. About a week later, the royal family’s attendants were taken from the Tower for interrogation, among them the Princess de Lambelle, of the House of Savoy, who was a confidante of the queen. Unfortunately the princess was transferred to La Force prison and was a victim of the September massacre which was a brutal addition to a time that would become known as the Reign of Terror. After begin brutally murdered, her head was put on a spike, taken through town, and the people drank to her death. Although the head was cruelly paraded outside her prison window, Marie Antoinette to did not look upon it, and in fact after hearing about her companions horrible death, fainted, and I’m sure was physically ill as well. 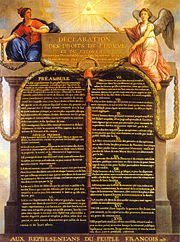 A month later, the first National convention was held, and the monarchy abolished, and France declared a republic. Now that Marie and Louis were no longer queen and king, they were considered prisoners under arrest for treason. Their names were even restyled as the “Capets.” In December Louis “Capet” was separated from his family and brought to trial, his charges trying to undermine the First French Republic. The convention, let by Jacobites, found him guilty and did not want to keep him hostage. Instead, a month later he was condemned to death by guillotine. On January 21, 1793, he was executed, leaving Marie now a widow, in a more perilous situation than she was before. She crumbled inside, refusing to eat or exercise, instead preferring to lay in bed. She didn’t proclaim her son queen either. Which could either be because she was too depressed to think about it, or because she feared that would be sending him to his own death. Her health declined and she suffered from tuberculosis and hemorrhaging. Despite her health, her fate was still being discussed by the new government. Later that year in July, her son was taken from her and given into the care of a cobbler. 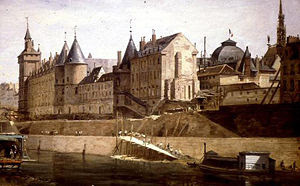 In August she was moved to the Conciergerie prison. Many plots for her escape were made, but Marie refused them all. In October she was brought to trial accused of sending millions of livres from the French treasury to Austira, conducting orgies at Versailles, plotting to kill the Duc D’Orleans, declaring her son to be king of France, and planning the death of all the Swiss guards who protected her during the massacre at her palace, and most obnoxious of all, that she sexually abused her son. After two days of proceedings, on October 16, 1793 she was found guilty of treason and sentenced to death that day. She was beheaded by guillotine and her body thrown in an unmarked grave at La Madeleine cemetery. What happened later? Her son, Louis-Charles died at the age of ten from maltreatment and malnourishment. Her daughter, Marie-Therese-Charlotte somehow managed to survive the Reign of Terror and was taken in by her uncle the Emperor of Austria, married Louis-Antoine of France, and was queen of France for twenty minutes. She had no children. In 1815, Marie Antoinette and her husband Louis were exhumed and given a proper burial, now resting eternally in St. Denis Basilica. She is seen as a martyr for the French nobles and royals. Great info, Eliza! I agree with you: I feel some sympathy for her. What a life! Eliza, here's another bit of info your readers might like to know: when the mob removed the Princess de Lamballe's head, they marched off to see Marie Grosholz, and forced her to make up the face and dress up the hair before they paraded the piked head past Marie Antoinette's window. Marie Grosholz would later become Madame Tussaud, of wax museum fame. Marie was the court's art tutor and would have known the unfortunate princess. Thanks for the great post about Marie Antoinette. I can never get enough of reading about her. Christine!!!! That is so exciting!! Congratulations! And here I was last week praying it would be soon when you told me about your books! Yay! Keep me posted about the release date! And a huge thank you for the info you provided regarding Marie Antoinette's dear friend Princess De Lamballe and the woman who would become Madame Toussaud, absolutely fascinating! It is not easy to summarize Marie-Antoinette's life in two posts, as you just did. Congratulations on a great job! Indeed there is no proof of a sexual liaison with Fersen. As for the Queen's role in the dismissal of Necker at the onset of the Revolution, she was always a hardliner, much more so than Louis XVI. Did Marie-Antoinette refuse to escape from La Conciergerie? Some of those plots came very, very close to succeeding, with her active collaboration, and at one point she made it to the front courtyard of the Courthouse, only a few yards from liberty. 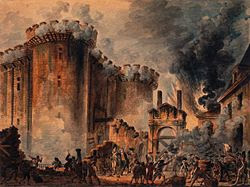 A footnote on the storming of the Bastille: the sole purpose of the insurgents was to seize ammo to defend Paris against the anticipated attack by the foreign regiments loyal to the monarchy. Freeing the prisoners at La Bastille was an afterthought. Most of them (including the infamous Marquis de Sade) had been transferred to other jails a few days earlier anyway. Thank you for your insight Catherine!!! I will be visiting your blog later today. Brilliant follow up! I am curious if you think Marie Antoinette had an affair with Axel? I have never been convinced either way. Thank you Bearded Lady! I sooo wish they had a faster carriage, it would be so interesting to see how things would have turned out if that were the case! Reading your two posts on Marie was a whirlwind story that moved so quickly! (loved it!) I imagine this is much how she felt sitting before her trial that final day -that everything, wonderful and bad had blown by instantly. And the amount of detail you have fit in! I really enjoyed these and your other posts and I would love to hear your view on her daughters life post-revolution! I will certainly be back! A most informative post and one from which I have derived a great deal of pleasure whilst reading it. Antoinette has remained an iconic figure with camps in her favour or against her evenly split down the middle. I have always believed that she was a woman (even though she came from 'forward-thinking' French society) played a major role in her demise. Greetings to you A Cuban in London! I'm so happy you enjoyed the post and found it to be informative and that it gave you pleasure :) I agree that she surely had a hand in her own demise as well. I can't help but wonder if she had done some things differently if the French Revolution would have happened. Absolutely wonderful writing, thank you so much.